Serverless applications enable you to break large projects into smaller, more manageable services that are independently scalable, secure, and reusable. As serverless architectures grow, common patterns emerge that often get re-implemented across companies, teams, and projects. Building with nested applications allows you to quickly assemble reusable serverless architectures in powerful new ways—accelerating your development velocity and reducing duplicated efforts. 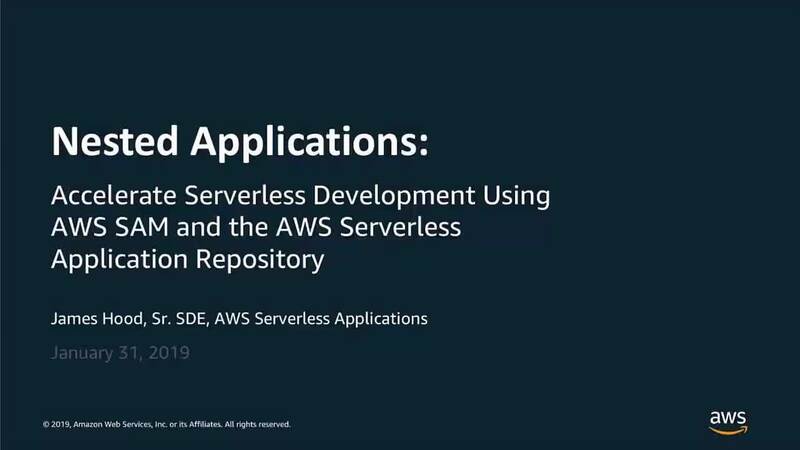 In this tech talk, you’ll learn how to compose nested applications using the AWS Serverless Application Model (SAM), SAM CLI, and the AWS Serverless Application Repository. You’ll also learn how use permissions to easily share serverless architectures across accounts, teams, and organizations.